4 Bedroom house with large garden and earning potential. Exciting Opportunity To Buy 5 Acres of Building Land Set In Stunning Countryside. Detached House with conservatory & Garden, ready to move into, situated 5mins walk to café. Boussac is situated in North-Eastern Creuse, a small department in the Limousin. It is considered to be off the beaten track, where the pace of life is considerably slower. Despite its shy character, Boussac is a very pretty town, dominated by picturesque brown roofs that blend in with its gothic Chateau. The town has a population of just over 1600 inhabitants, although if you include the surrounding villages, which economically and culturally are a part of Boussac, then the number jumps to almost 6000. The castle is a magnificent structure. Inside you will come across a dazzling array of intricate tapestries, which are considered to be some of France's best. The town is encircled by La Petite Creuse and Le Beroux rivers. On top of the castle there are fantastic panoramic views of the countryside below. 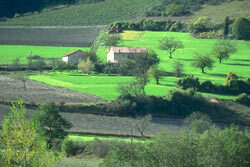 Boussac is considered to be the divide between the areas of the Limousin and Central France. To the North you will find the vast plains of Berry, in the East is the hilly landscape of Auvergne, and in the South lie more wooded areas. This contrast in landscapes makes Boussac a perfect place for nature lovers. There are a number of hiking and cycling trails in the area. The market takes place every Thursday. On the 1st and 3rd Thursday of each month there is a cattle market. Industry has moved into Boussac in recent years but if you'd like a glimpse of how the residents used to work then take a visit to the Rural Museum where old farming equipment has been fully restored. There are plenty of opportunities for sport and relaxation in the town - everything from fishing to judo. The nearest airport is Limoges, which has frequent Ryanair flights. Air France also do a service, although you need to change at Paris' Orly airport. If you're going across land then you could take the TGV train service to Limoges. Travelling by car is also a viable option; simply take the A10 from Paris. Property prices are very low and are great value for money. Some of the houses favour people with a bit of spare time to invest in their property as they are in need of renovation. There are many great bargains to be found. Do you know Boussac better than we do? Do you have photos of Boussac? Towards the north of the Haute-Vienne department, within the Limousin. 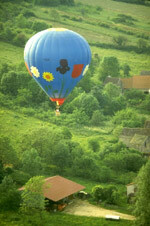 Access: Nearby Limoges is accessible by both air and via the TGV rail network. Economy: Boussac is still an active market town. Interesting fact: It may be a small town, but Boussac comes with its own castle and some of France's greatest tapestries.